"Nobody talks about that Christmas anymore. Rumor became myth, new stories and small-town gossip wallpapered over that whole winter." Tim Burton is nothing if not eccentric and the oddities of his thought process make for fantastic films. One of those films was Edward Scissorhands, the somewhat odd tale about a man with scissors for hands and his struggle for wider acceptance. 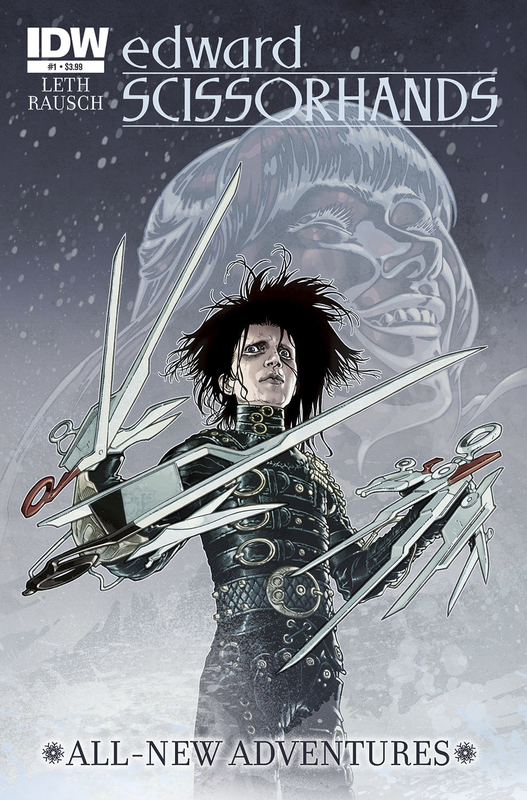 The book tapped into a slew of other themes as well and IDW Publishing is continuing that universe in Edward Scissorhands #1. The issue is written by Kate Leth, illustrated by Drew Rausch and lettered by Travis Lanham. In castle just outside a sleepy suburban town, a brilliant inventor created Edward Scissorhands, but left him tragically unfinished. Two generations of exile have left Edward digging through abandoned experiments, but once he wakes up a creature left buried, he discovers he isn't the only one missing a vital piece. As Edward tries to fix a grave mistake, he comes face to face with a teenage girl who was sure he was only myth despite the stories her grandmother told her, about the man she could never touch. In Edward Scissorhands #1, it's been fifty years since the end of the movie. A lot has happened in that time, but Edward Scissorhand as an outcast remains constant, even if Megan's grandmother Kim tried to convince her (and others in the town) otherwise. The re-introduction to Edward is handled deftly, presenting him in his familiar solitary state. And while the world around him has clearly moved on, it feels as if nothing's changed. Edward still seeks the company of another to make him feel whole, yet that someone in this case might be a little more on the dangerous side. Leth does a fantastic job of conveying Edward's loneliness as a parallel to Megan's struggles as a teenager, something the film so brilliantly captured. In some ways, we're all outsiders and it's a theme that remains relevant nearly 25 years after the film's theatrical release. Much of that loneliness is amplified by relatively little dialogue, with the setting doing a fantastic job of oozing atmosphere. Rausch's work is a mix between cartoon and dark drama. It fits the story perfectly, as his Edward still manages to look menacing in some regards because of his hands and pale face, yet there are other times when his facial expressions almost look like caricatures of the emotion they're amplifying. He offers subtle touches (such as Edward's disheveled hair) that make the book feel as if it's part of the universe created by the film, which further helps the reader get drawn in. While the panel layouts are fairly traditional and safe, they do add a certain cinematic quality to the book where the reader feels as if they're following the story frame by frame. The reliance on dark blacks and blues sets the somewhat isolationist and depressive tone even better. Edward Scissorhands #1 feels as if it's a worthy sequel to the movie. The settings and characters all feel familiar to those who saw the film, offering a rather seamless transition to the world portrayed in the comic book. Leth's story is very evenly paced and does enough to both reacquaint the reader with Edward and his world while also introducing a potentially dark new dynamic to contend with. Rausch's illustrations are a good mix of humor and eeriness, with Edward himself looking more than familiar to readers. Edward Scissorhands #1 is a very strong return to Tim Burton's world, tapping into many of the same themes and exchanges that mades the movie such a classic among many audiences. Edward Scissorhands #1 is in stores now.